Vegan. Enriches. Repairs. Nourishes. 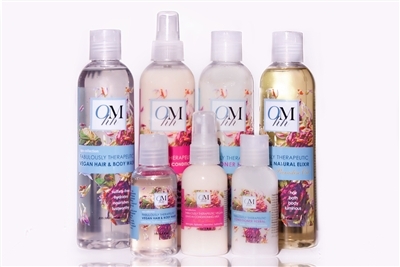 No parabens, Not tested on animals, Suggested for all hair types. Reverse dry, damaged hair and skin to a radiant, healthier condition. This must have kit has everything you need for an easy TRANSITION to healthier hair and softer skin. OMhh F.A.B. Healthier Hair Kit is rich in botanicals, herbs, vitamins and other restorative natural ingredients based on traditional, holistic therapy. Less damage . Less shedding . Stronger, longer hair . Softer skin. Uses: Complete & total foundation for healthier hair and skin. Shampoo. Body Wash. Conditioner. Skin Conditioner. Hair & skin luminizer. Hair & skin softener. And so much more. Vegan. Enriches. Repairs. Nourishes. No parabens, No mineral oil. Not tested on animals, Suggested for all hair types.